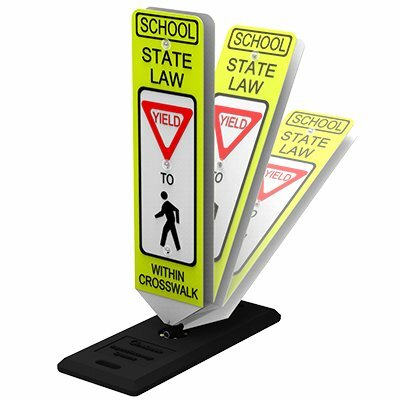 Spring-loaded In-Street Pedestrian Crosswalk Signs reduce the risk of pedestrian injury or property damage at school crossings, and are MUTCD compliant. This Diamond Grade reflective sign provides the best available visibility for unsignalized intersections in school areas, up to 1,500 feet at night or in overcast conditions. The double-sided, fluorescent yellow green, 12"W x 36"H sign is attached to a 31 lb base with a reactive spring assembly that bounces back upon impact, and is NCHRP-350 compliant. Post and panel are constructed of flexible polyethylene plastic that is resistant to ultraviolet light, ozone and hydrocarbons. Anti-twist feature always keeps the signs facing forward into traffic. Choose between a 14" x 34" One Base© Portable Quick Release base or an 8" x 8" Surface Mount Fixed base that mounts to the ground using the included hardware. 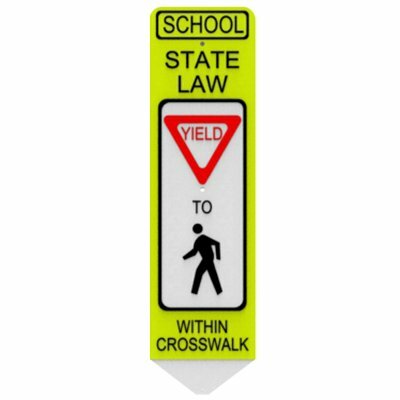 “YIELD" In-Street crosswalk sign conforms with R1-6 MUTCD code; 12" x 4" “SCHOOL" plaque mounted to top of sign conforms with S4-3P code. “STOP" In-Street crosswalk sign conforms with R1-6a MUTCD code; 12" x 4" “SCHOOL" plaque mounted to top of sign conforms with S4-3P code. Overall height of unit is 47".